Be it school, home or office, the use of boards can never be questioned. But it is the glass whiteboards that has garnered importance among the users. The clear display, the ease to clean these boards and the way these are designed make the glass whiteboards a demanding piece in the market. However, are you worried that it will have a sudden fall and break into pieces? Do not panic as the secured positioning and fitting of the boards will prevent any sort of sudden accidents. Now write down all the necessary notes on the glass board that comes with good looks. Having a tempered glass surface, it is less porous as well as less absorbent compared to other standard boards. The magnetic board prevents from sudden falls, both dry erase and wet erase markers can be used for writing down on the board. It also has a tray which can be adjusted to place your markers. Get this frameless board that matches any interior and be sure that it will never have scratch, stain or dent. The trustworthy whiteboard from Audio-Visual Direct is modern and appealing. Be it home or office, you can write down anything on this board as it doesn’t allow ghosting or staining. Further, the smooth surface that is made of glass is appropriate for dry erase markers. Coming with an aluminium tray, the markers will be within your reach. But how to clean it? Well, just a single swipe and the glass board will be ready to use again. Install it easily without spending much energy as the wall anchors and metal mounts will help you to do so. Another product from Quartet that assures to deliver topnotch performance, the modern whiteboard is a suitable match for any office. The white finish tempered glass promises a clean, ghost and stain free surface even after numerous cleans. 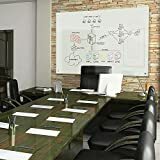 Apart from being non-magnetic, you can use any colour dry-erase marker to write on this opaque attractive board which is also non-absorbent and facilitates clear display. Make heavy use of this board, it will give effective results time and again. Also, it has a market tray to put your markers thus there is no chance of losing anything. Quartet seems to manufacture quality whiteboards for daily use. The premium whiteboard has magnetic tempered glass that further has two round magnets and also a dry erase marker for smooth writing. One can even use earth magnets for expressing through messages. Also, it is highly durable and has a frameless design. So, you can just put as many whiteboards as you want side-by-side in your workplace or home and continue jotting every important detail. Finally, it has an attached aluminium marker tray for keeping the markers safe. Balt has modernized the whiteboard to render a smart look to the available space. Being a magnetic white glass board, the superior product is extremely functional. That seamless design impresses every user and goes with every sort of interior setup. Furthermore, the surface, as well as colouration, is designed in such a manner that you are going to obtain perfect optical qualities along with ambient light toleration and contrast. Use a grease pen, dry erase marker or wet erase marker and place it on the aluminium tray, you are surely going to get amazed by seeing the results. And the stain, as well as ghost resistant feature, makes it a desirable product. 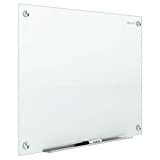 Your home or office clearly needs a sophisticated whiteboard for getting a crisp display. It has a special finish for interruption-less writing and the sleek writing surface adds to the endless benefits. From grease pens to dry or wet erase markers, your work will be done without any disturbance. Plus, the stainless steel mounts compliments to the elegant board. Say no to stain and ghost by using this glass whiteboard. You can never go wrong when you are using a Quartet glass whiteboard. 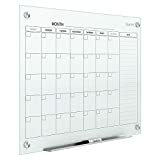 Plan your schedule and have a track of it as this calendar design is a suitable companion for your office or personal use. Apart from having enough space to write, it also has a right-hand column that allows you to jot down all the extra necessary notes. 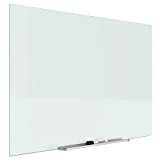 This tempered glass whiteboard is magnetic and has frameless boarders. Moreover, the non-absorbent glass comes with a marker, high-power magnets, two rare piles of earth and an extended magnet tray. Clean it and use it for months as well as years, the stain-free whiteboard is an excellent choice. No one denies the excellence of the whiteboard from CO-Z. High-quality rare earth magnets that will keep your papers on the place are used to facilitate the safety of all the documents. The long-lasting tempered glass is not easily breakable and is also anti-explosion. Clean it effortlessly and install it without spending much of your energy, the frameless board will not tolerate any sort of ghosting or stains. Hang it vertically or horizontally, make total use of the board. Experience smooth and hassle-free writing on an even surface, one can even attach papers with the help of neodymium magnets in this glass board. This dent, stain and scratch resistant board have 4 PP plastic corners. But do you want to know what makes this product praiseworthy? Well, the whiteboard is mobile. Confused? The board has a round base which has five movable wheels and hence, you can take the board anywhere. Plus, the wheels have locking brakes so you can make it stable by locking it whenever you want. 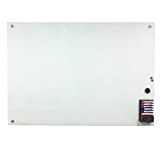 Be ready to get impressed with the best product on this list of large glass whiteboards as this white frost board is the one you are looking. The modern appearance facilitates the users to place many borderless glass whiteboards side by side for creating an extended writing surface. Note every single detail in this tempered glass board with dry erase markers. For home as well as commercial use, continue heavy writing without any interruption. 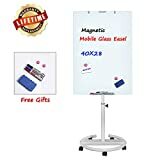 No more of spending money endlessly on getting new DIY glass magnetic whiteboards as these boards guarantees excellent service. Write, scribble and erase the writings done for uncountable times, the whiteboards will be at your service every time.